My maternal Grandmother always kept a box full of toys around to keep the grandchildren busy while the adults visited. She also kept other games and goodies in her front closet or in a cabinet in the spare bedroom. My siblings and I love to tell stories about these toys and games when we get together. Most are long gone but some still survive and are owned by us grandchildren. Gram would often join us when we played. I remember playing whiffle ball with her in the front yard or playing stadium checkers or tiddly winks on the living room floor. She was a shrewd Yahtzee player and a phenomenal card player. My grandfather would play cards with us, let us set up croquet on the front lawn, or beat us soundly at Bocci Ball. This page is dedicated to my memories of my grandparents. Hanna-Barbera cartoons were a staple source of entertainment for children growing up in the late 1950's, the 1960's, and into the 1970's. 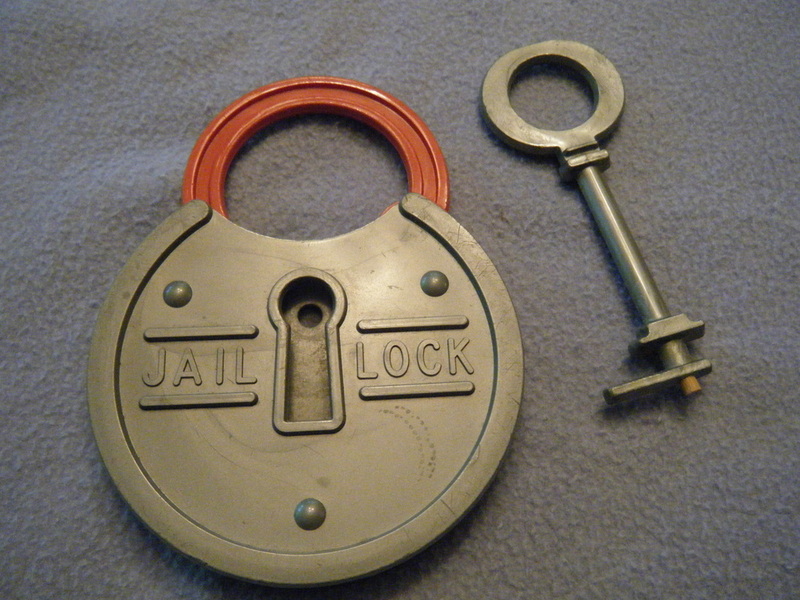 On Saturday mornings, my siblings and I would keep squinting at the pocket watches we kept near our beds to see if it was time for our cartoons to begin. As stealthy as ninjas, my brothers and I would put on our robes and slippers in the dark, and sneak past our parents' room and out to the living room where we would fire up the black and white TV set. Sitting cross-legged on the floor (and way too close to the screen), we would watch several hours worth of cartoons. Our sisters would often join us by stealing down from their upstairs bedroom, being careful not not to wake our parents while opening and closing the hallway door. Inevitably, we would start giggling, which would rouse our father who would emerge from his lair like a tousled and grumpy bear. After he gave us his usual "sleep-in and don't wake your mother and I" speech (probably more for the benefit of our mother - who never emerged from the bedroom but was probably listening to verify that the correct level of parenting was administered) he would put on his glasses and join us watching cartoons and laughing along with us. The launch of the new Saturday morning line-up each fall was always greeted with much anticipation and good behavior so as not to be banished to our rooms for childhood squabbles. Later, a second TV appeared in the basement for our benefit. Getting to the basement was doubly tricky as we had to sneak through the kitchen doors into the basement without waking dogs and cats who would demand to go outdoors or be fed. The morning "scoldings" still continued because we got into more raucous games like "Hands Down" and "Paddle Pool". Two iconic cartoon characters from those days are Huckleberry Hound and Yogi Bear. Of course they were merchandised as much as possible. 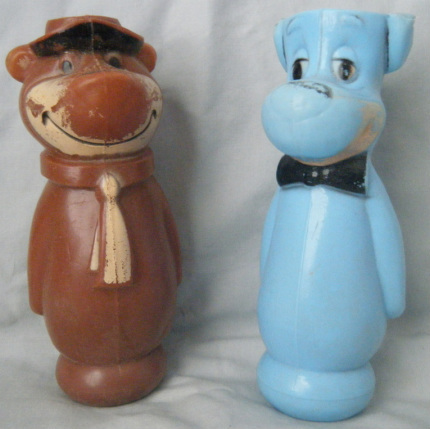 One product that I remember is a set of Huckleberry Hound and Yogi Bear bowling pins that my Grandmother kept at her house for when her hoard of grandchildren would come to visit. From some mysterious location, she always brought out the coolest things for us to play with - whirling helicopters, stadium checkers, tiddly winks, red rubber K-gun ping pong ball shooters, and such. Huck and Yogi bowling was only allowed in the "back room" or out on the front walkway. Bowling would never last very long as no one wanted to spend several minutes gathering scattered pins and resetting them only to have a sibling knock them down in under 5 seconds. Over the years, the number of pins kept going down. I imagine they broke and were thrown out. When my grandparents passed away, one of the keepsakes I requested was a pair of the remaining bowling pins. All I have to do is look at the pins and I am whisked back in time to those golden days playing games with my grandparents. 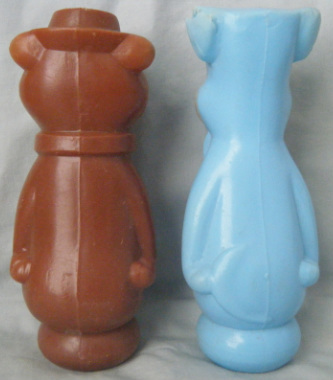 Yogi Bear and Huckleberry Hound bowling pins. The paint did not survive years of being bounced about. It is hard to tell from the photo, but the plastic has worn through in several places - especially on Huckleberry Hound's ears.